Plaid is a timeless and classic pattern and it is the perfect pattern for any accessory, for any occasion.. Our plaid is completely recolor able - so you can create any color scheme that you want to. Make it feminine by adding pinks and purples or blue and reds to more masculine. We offer 100s of colors to choose from. 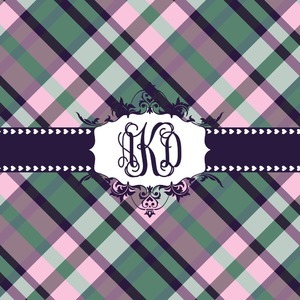 To showcase our design, we chose a combination of pink and purple, and added a pop of mint - making our plaid very girly. We offer several ribbon and label choices - and are always adding new styles. Of course, personalization is a choice - so you can remove the personalization or you can select a different ribbon, label and personalization style. We chose our fun heart ribbon, along with one of our super fancy labels, since the label looks like a crown, we had to choose the interlocking monogram for our personalization.